At least six persons were killed and more than 24 injured in a bomb blast after Friday prayers at a Shi’ite mosque in the central Iraqi town of Baquba, police sources said. Reaching their final resting place, the ashes of India-born Army Sgt Uday Singh, who died in Iraq fighting for US, have been buried with full military honours at an American cemetery in a solemn and poignant ceremony. Concerned by the second suspected case of SARS, experts from the World Health Organisation are in Guangdong province to help the local authorities in their probe for the origin of the virus. Five of the 10-member joint team arrived in Guangzhou, capital of Guangdong, yesterday, including two WHO epidemiologists and some officials of the Chinese Health Ministry (MOH). Amid talk of a possible extradition treaty, India has renewed its request for extradition of Mumbai underworld don Dawood Ibrahim and 13 other wanted Indian nationals who have taken refuge in Pakistan. Appreciating the decision of India and Pakistan to commence a composite dialogue, the USA has offered its “good offices” to the two countries to keep the peace process moving forward. Barely a few days after the historic interaction with Prime Minister Atal Bihari Vajpayee, there was a major security breach during the movement of Pakistan President Pervez Musharraf’s convoy on the Islamabad highway when a pick-up van broke into the security cordon. Pakistan plans to book some of its nuclear scientists under the Official Secrets Act for allegedly passing sensitive nuclear secrets to a third country. A body found in a University of Florida housing complex has been identified as a graduate assistant from India, the police said. They said he was stabbed to death. More than 100 previously unpublished photographs of Hollywood film legend Marilyn Monroe taken by her friend Sam Shaw will be released in a book at the end of the month, its German publisher has said. Police and witnesses said the bomb shattered windows and damaged cars outside the small mosque in a residential area. Officials at a nearby hospital said they knew of 39 persons injured. US military officials on the scene said they were investigating. Baquba, 65 km north of Baghdad, is in a largely Sunni Muslim area which is a hotbed of resistance to the US-led occupation of Iraq. US forces have mounted major operations in and around the town to try to capture insurgents. A car bomb outside the main mosque in the Shi’ite holy city of Najaf August last killed more than 80 persons after Friday prayers, including a senior Shi’ite cleric. The ashes of 21-year-old Uday, who died in Habbaniyah in Iraq from injuries he received when his patrol was attacked, were buried yesterday at the Arlington National Cemetery along side thousands of war veterans who have died under the American flag since the Civil War. The ceremony was attended by his father Lieut-Col Preet Mahinder Singh, his mother Manjit Singh Taunque, his sister Bani, a host of other relatives and a large gathering of friends, who braved the very cold weather to be present in strength to accord a hero’s farewell to the young and only Indian who died fighting for the US. Pentagon official Mark O’Neill representing the US army, Brig Shankar Ghosh, Defence Attache at the Indian Embassy and Air Attache Sumit Mukherjee representing India and the Indian Embassy were present on the occasion. The ceremony began when two US marines took the ashes, held in a wooden box and wrapped with an American flag and marched slowly to the burial site. With a 21-gun salute and the bugles sounding the last post, the flag was removed and the box was buried. The flag was then presented to Uday’s father and mother. His sister placed flowers at the burial site. 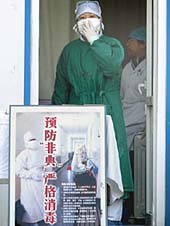 Concerned by the second suspected case of SARS, experts from the World Health Organisation (WHO) are in Guangdong province to help the local authorities in their probe for the origin of the virus. Five of the 10-member joint team arrived in Guangzhou, capital of Guangdong, yesterday, including two WHO epidemiologists and some officials of the Chinese Health Ministry (MOH). Robert Breiman, who is heading the WHO team, said the joint mission would look into the recent occurrence of the diagnosed SARS case in Guangdong, and their major concerns would centre on the potential human, animal and environmental sources of the infection. Sources at the Guangdong provincial health bureau said three Chinese experts and one WHO expert of the joint team were already in Guangdong, and another world agency’s environmental expert from Canada would join the team later in the day. The team was scheduled to stay in Guangdong for a week. HONG KONG: The third of the three Hong Kong television station workers who came down with fever after returning from southern China has tested negative for SARS, a government spokesman said on Friday. The other two men tested negative for SARS on Thursday. English daily The News, quoting unnamed Pakistan Foreign Office officials, said India had sought the extradition of 14 of its nationals figuring in the list of 21 given in 2002. A Foreign Office source said the list gave background of some cases going back to 1981. India is seeking the extradition of its “most wanted man” Dawood Ibrahim, who according to recent US reports lived in Pakistan under a false name and possessed a Pakistani passport, and 13 of its other nationals, it said. The list also included, chief of Jaish-e-Muhammad Maulana Masood Azhar, leader of Lashkar-e-Toiba Hafeez Saeed and leader of Hizbul Mujahideen Sayed Salahuddin. Pakistan had said in 2002 there was no question of extraditing Azhar and Hafeez Saeed as they were Pakistani nationals. The daily said Pakistan and India, who are once again in the process of reviewing and updating their old lists of wanted criminals, were likely to exchange the lists after preliminary talks on the issue of extradition treaty entered a crucial phase. The newspaper quoted a top government official as saying modalities for the extradition treaty with India were being worked out because of the “pressure” from the US government that wanted Islamabad to cooperate with New Delhi on the issue of extradition of certain wanted men. Also, in an apparent bid to counter the Indian demand for handing over 21 most wanted persons, Pakistan has told India that it would provide New Delhi with its own list of wanted men, ‘The News’ said. “We will lend help assistance Pakistani friends to keep this process moving forward,” Secretary of State Colin Powell told reporters here yesterday. “I had a good conversation with President Pervez Musharraf and Foreign Minister Yashwant Sinha of India and Foreign Minister Kasuri of Pakistan on this,” he added. Describing the decision by India and Pakistan to commence talks, during the recent SAARC summit, as historic, he praised both countries for the progress. Powell also said the USA was “working closely with our Pakistani friends to get them to use all their assets and resources against Taliban elements on the Afghan border. And I was pleased to see that the Pakistani army began operations on Thursday morning in that regard. The incident took place on Wednesday. Earlier, there had been two failed assassination attempts on the life of the President. “Islamabad has said it is contemplating registering cases under the Official Secrets Act against some of country’s nuclear scientists, who are alleged to have passed on sensitive nuclear secrets to a third country,” local daily ‘The News’ said in a report. Since Sunday, university officials believed the body might have been that of Sudheer Reddy Satti, 24, who rented the apartment where the body was found. Dr William Hamilton, area medical examiner, confirmed that it was. Satti was last seen alive on December 31. Lt Joe Sharkey, a spokesman for the University of Florida Police Department, yesterday said Satti received multiple stab wounds and that no weapon was found at the scene. No arrests have been made in the case, the first murder on the campus in 25 years. Satti came to the United States to work on his graduate degree in civil engineering in 2002. He worked as a graduate assistant while working on his doctorate. The book “Marilyn Monroe — The New York Years” from Berlin publishing house Lardon Media will go on sale from January 30 in tandem with an exhibition of some of the photographs, said the company spokeswoman yesterday. “Of the roughly 160 photos shown in the book, only 40 are known,” Claudia Lardon said. Perhaps, Shaw’s best-known photograph of Monroe is from the film “The Seven Year Itch” and features the star holding on to her white dress as it is blown upward by a draft from an underground train ventilator shaft. Shaw died in 1999, but his son Larry gave Lardon Media the rights to publish the pictures because “we have a friend in common”, said founder Thomas Lardon. “The photos will be accompanied by some original quotes from the star and captions. There will be very little text,” he said. The book will be published in English and is expected to cost just under 30 euros ($ 38). Some of the works featured in it will go on display at the chic Einstein cafe on Berlin’s Unter den Linden boulevard.